When the pumpkins start showing up at the Farmers Markets I know it's time to get all the pumpkin recipes out and get to cooking. This year I decided to make a new pumpkin cookie, just a real simple soft sugar cookie that is filled with a pumpkin spice and flavor and then cover with a flavored sugar. It really doesn't get much better than this, and I already know that I can't eat just one of these cookies! 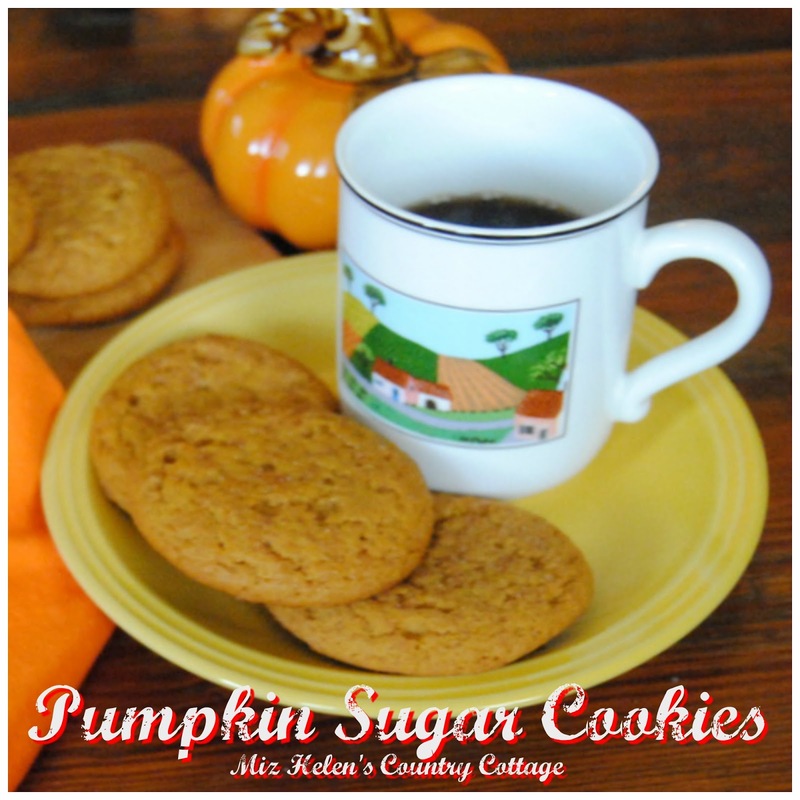 Pumpkin Sugar Cookies A Great Fall Treat! In a large mixing bowl, beat the butter until creamy. Add the sugar , pumpkin, vanilla, baking powder, pumpkin pie spice, and salt. Beat until thoroughly combined. Add the egg and beat well. Cover the dough and chill for 1 hour. Mix the topping in a medium mixing bowl. Line a cookie sheet with parchment paper or a silpat baking mat. Shape the chilled into 1-1/2 inch balls then roll in the sugar mixture. Place the cookie balls on the cookie sheet. Bake at 350 degrees for 12 minutes. Remove to a cookie rack to cool. Can't Wait To Have These Cookies! I was so happy to have you stop by to enjoy these great Pumpkin Sugar Cookies with us today. It is nice to just stop for awhile and visit with a friend while we enjoy a very special treat! Hope you have a great week and come back to see us real soon! I bet your whole house smelled amazing!! Rustown Mom, the house sure did smell good and the family took the cookies off of the cooling rack so fast I almost didn't have enough for my photos. These are delicious cookies! Thanks so much for stopping by and have a great day! These cookies do smell wonderful while baking and save a couple back for yourself, they will go fast. Thanks so much for stopping by today and enjoy your cookies! Mmmm, now I want a cookie! These look fabulous! Thanks so much Carlee, wish I could give you a couple through the screen. Thanks so much for stopping by and have a great day! Oh Helen these sound so yummy!! One of the best pumpkin cookies I've seen yet! Thanks for sharing at the What's for Dinner party - hope your bring more recipes next week! Have a fabulous week. I always buy too much pumpkin puree, so I am looking forward to making these cookies! Visiting from Not a Trophy Wife link party! Congratulations! Your post was my feature pick at #OverTheMoon this week. Each Hostess displays their own features so be sure to visit me on Sunday evening and to see your feature! I invite you to leave more links to be shared and commented upon. Please don’t forget to add your link numbers or post title so we can be sure to visit!